While it would be fun to hear a certain chant for a certain former owner during tomorrow afternoon’s game, it feels far better knowing the Crew is here to stay in Columbus with a future as bright as the team’s signature banana kits. Be sure to watch Columbus Crew SC vs. New York Red Bulls on SportsTime Ohio at 4:30 p.m. ET. The Modell Law–decades after it was enacted after former Cleveland Browns owner Art Modell sleazily moved the Browns to Baltimore back in 1996–has succeeded in helping to keep the Columbus Crew in Ohio’s capital city in 2018. 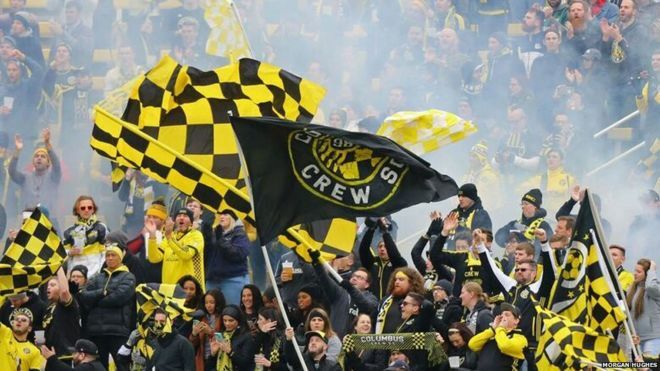 New owners have officially reached a deal (in principle) to keep the Crew in Columbus. These aforementioned new owners are the Haslam Family of the Cleveland Browns and the Edwards Family of Columbus. The latter was led by now former Crew doctor Pete Edwards. And while these new owners have been known for a while now, it’s a considerable relief to know that legally there are no more hurdles to jump. While I could post statements from MLS and a certain former owner on this development, I won’t. There are no apologies included and no recognition of the reality of this embarrassing and frustrating ordeal caused by Commissioner Don Garber’s MLS and a certain former owner of the Columbus Crew. And it was legen-we don’t have to wait for it because the day has finally arrived when we legally #SavedTheCrew-dary! P.S. The Ohio legislature should draft and pass a Precourt Law, if for no other reason than to make Anthony Precourt even more synonymous with Art Modell’s shameful legacy as a sports team owner. Sigi Schmid, an accomplished collegiate and professional soccer coach in America, died yesterday in the Ronald Reagan UCLA Medical Center at the age of 65. He had been hospitalized for three weeks. The reason for his hospitalization was that he was in need of a heart transplant. For soccer players who were guided by his wisdom of the beautiful game, as well as countless fans, this is devastating news. Sigi Schmid was a dominating force in MLS specifically and American soccer broadly. His coaching resume includes UCLA, a couple runs with the United States U20s, the LA Galaxy, the Seattle Sounders and the Columbus Crew. As a lifelong Crew fan, Sigi Schmid unforgettably led the original Black & Gold in MLS to the club’s first-ever MLS championship in 2008. In addition to watching that title team play in Columbus throughout 2008, I was lucky enough to watch the Crew defeat the New York Red Bulls 3-1 in Los Angeles with my parents. That game and celebration were massive. Another part of his legacy was wearing a Crew scarf, regardless of the temperature. This tradition revealed his sincere embrace and lifelong membership in the Columbus Crew community.